Nicholas Roerich's estate-museum in the village of Izvara is a site featuring a unique blend of nature, archaeology, architecture, history and culture – the first ever state museum in Russia dedicated to Nikolay Konstantinovich Roerich – famous Russian painter, scholar, traveller and public figure, who spent his formative years in this old Russian estate. Dating from the 18th century, the estate had passed hands of many a famous aristocratic family, such as the Sheremetievs, the Trubetskoys, the Saltykovs and the Veirmans, until in 1872 it was acquired by the painter's father. Izvara remained in the family possession from 1872 till 1900 when having been purchased by the Ministry of Justice it was transformed into St.Petersburg Juvenile Agricultural Colony. The already existing buildings were harmoniously supplemented by those of the colony following a design by architect A.Yakovlev (1916). Roerich's estate-museum in Izvara opened in 1984. At present the estate comprises nine buildings constructed in the 18-20 centuries, an old park and spring lakes, situated on the land covering 60 hectares. The manor house of the 18th century contains the permanent and special exhibitions dedicated to the life and art of Nicholas Roerich. 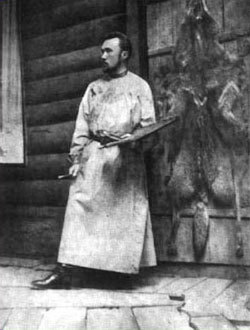 Displayed artefacts from the Russian period of his life illustrate the influence of Izvara on Roerich's art and provide the specific atmosphere of a Russian estate. The presented materials illustrate development of Roerich's idea about the preservation of human cultural values, embodied in Roerich's Pact (signed in Washington in 1935). Also on display are Roerich's early works: a sketch to the fresco “Kievan Bogatyrs’ Evening” (1896), a study entitled “The Ferns” (1890-s); the painter’s autographs, personal belongings and furniture. The school house of the Agricultural Colony constructed in art-nouveau style and its in-built church of Our Lady of Kazan (currently functioning) also make part of the museum complex. The museum organises conferences, festivals, musical and poetic soirees, as well as various international peace-promoting actions. On the day of Nikolay Roerich's birthday – 9 October – Izvara estate hosts the regional culture festival entitled "Light Up Your Hearts". Since 2002 the Izvara museum houses a scientific expedition of multiple orientations with the purposes of studying local nature and carrying out archaeological research. On 31 July 2006 the Governor of the Leningrad Region Mr. V. Serdukov signed a ruling on development of a national park within the boundaries of the estate-museum. Admission (as of 1 May 2007): Adults – 40 Rub, children (7-16 years) – 10 Rub, students and senior citizens – 20 Rub; for museum workers and WWII veterans admission is free of charge. The overall tour for groups not smaller than 10, comprising the exhibitions, the park and the estate: adults – 60 Rub, students and senior citizens – 40 Rub, school children – 30 Rub. If desired, the visitors may view videos about N. Roerich for an additional fee of 10 Rub. After a tour it may be possible to see the church of Our Lady of Kazan located in the school house. Opening Times: Wednesday – Saturday, 10.30 – 17.30, Closed – Monday and Tuesday. By car From St. Petersburg along the Tallinn Highway or through the town of Gatchina to Volosovo (85 km) and then to Izvara ( 12 km). By bus Taxi cab from Avtovo Underground Station (the bus stop is behind the public garden, opposite the Circus). The bus leaves every hour from 7.30 a.m. Buses #840, 843 from the Central Bus Station (Obvodny Canal Embankment, 36) to Volosovo, and then minibuses #34, 34-a to Izvara.